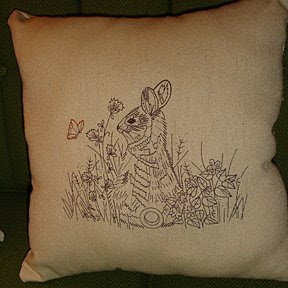 I love this rabbit pillow and have every intention of giving it to a friend. I found the fabric at a second hand store and I loved the detail of this drawing. I added a little orange embroidery on the butterfly for fun. 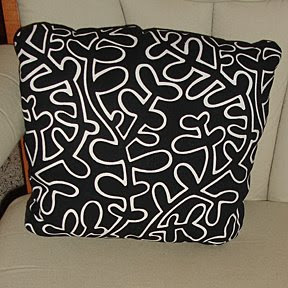 I made this originally as a seat cushion for my husband's computer chair - but it then transformed into a thicker plusher pillowed version of itself. It's the perfect modern splash my living room needed. was that bunny thing in the morgantown score?! YEAAAH love it!